"Atlantis," reads my copy of The Dictionary of Imaginary Places, "a vast island-continent submerged under the waters of the Atlantic towards the year 9560 BC; parts of it are still inhabited and can be visited." Alas, it's no longer on Google Earth: Google's just removed the fabled lost city from its virtual globe-mapping software -- if you believe the conspiracy theorists, anyway. Google 3D globe-mapping program can display underwater seafloor imagery, from tiny bumps that indicate undersea mountain chains to the contours of midnight-black trenches. But watchful users poring over the program's rendition of the Atlantic's seabed discovered an area with a gridlike pattern, which they assumed indicated sunken streets and byways. Those thoroughfares could only be one thing, they surmised: the mythical lost city of Atlantis. The Atlantis of myth was an elliptical island-continent with an advanced culture supposedly the rival of ancient Egypt and Greece. According to the philosopher Plato, the island eventually sunk into the sea after it was struck by a series of earthquakes. But no, says Google, the city-like seafloor grid was just a data glitch caused by errors in the methodology used to articulate the seafloor (in the "Atlantis" area's case, specifically the result of overlapping data sets). The fix is in this week courtesy of new data from oceanography groups, and it not only smooths over the so-called Atlantis swathe, but fixes artifacting present in other areas as well. 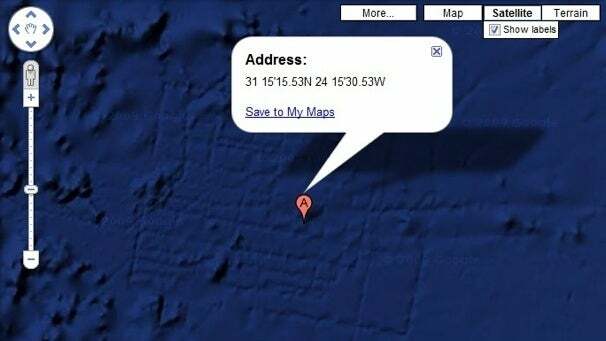 That'll be good news for serious seafloor-watchers: Google says Google Earth can now claim 15 percent of its seafloor imagery comes from shipboard soundings at a 0.6-mile resolution. That's compared to just 10 percent before (the remainder comes from extrapolated satellite data). "The original version of Google Ocean was a newly developed prototype map that had high resolution but also contained thousands of blunders related to the original archived ship data," said David Sandwell, a Scripps geophysicist, in a statement. "UCSD undergraduate students spent the past three years identifying and correcting the blunders." Matt Peckham writes for TIME and PCWorld. You can find him on Twitter, Facebook, or Google+, and find Today@PCWorld on Twitter for the latest tech news and analysis.